Your contact lens prescription allows you to purchase contact lenses that match your requirements from opticians or online suppliers. You should be given a prescription after a successful contact lens fitting, if you were not given a prescription, in the UK it is your legal right to have a copy, so do not be afraid to ask your optician for it. You don't need your physical prescription with you in order to purchase contact lenses from Vision Direct, but you do need to have a good understanding of what it is. You can find your prescription on the piece of paper given to you by your optician during a check-up, on the end/side of your contact lens box or on the blister packs that contain your contact lenses. A written prescription usually includes the following specifications: base curve, diameter, power (or sphere), and then additional figures for Cylinder and Axis if you have an astigmatism, and Addition and Dominant figures for presbyopia correction. The prescription for your left and right eye will be listed separately as they can vary. Name & expiry date: Your prescription should also contain the name of your contact lens e.g. Acuvue Oasys and an expiry date, which is usually a year from the date of your check-up. 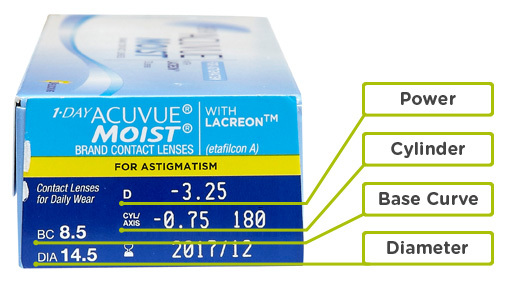 Below is an example of the prescription listed on the side of the box for 1-Day Acuvue Moist for Astigmatism. Please be aware that a contact lens prescription is different to a glasses prescription, so you cannot use one for the other. What does each prescription figure mean? Base Curve (BC): The base curve determines what type of fit is required for the lens to meet the curve of your eye; this is usually written in millimetres or sometimes with the words: flat, median or steep. Diameter (DIA): The diameter of the contact lens is also written in millimetres and determines the width that best fits your eye. Power/Sphere (PWR/SPH): This figure shows whether you are long or short-sighted and how much correction your eyes require. If you are long-sighted your figure will begin with a + (plus sign) and if you are short-sighted it will begin with a – (minus sign). This will be followed by a number that goes up from 0 in measures of 0.25 dioptres, the higher the number the stronger the visual correction needed (this value can be displayed on the box as "PWR" or "D"). The below figures are only displayed on contact lens prescriptions where there is a need for astigmatism correction. Cylinder (CYL): The cylinder will always been a minus number that increases in measures of 0.25. Much like the power/sphere figure that is shown on all standard prescriptions, the cylinder denotes the extra visual requirements needed for astigmatism and how severe the astigmatism is. Axis (AX): Astigmatism is caused by the irregular curvature of the eye; the axis is a figure which determines the angle of the correction needed in order to see clearly. The Axis is always a number between 0 and 180 degrees. The below figures are only displayed on contact lens prescriptions where there is a need for presbyopia/multifocal correction. Addition (ADD): If you suffer from presbyopia it affects your near vision, the Addition figure determines what level of correction you need to be able to see clearly at a close distance. This is a number between 0.50 and 3.00, some contact lens brands refer to this as a high, medium or low. Dominant: If you wear multifocals or bifocals your lens correction is determined by a dominant and non-dominant eye, this is the dominant figure usually marked with a “D” and “N” to express which eye is which.